ArtSites provides you with some initial galleries. However, you can have as many galleries as you want. You may want to add more or categorize your artwork differently, e.g. you may want to have a gallery called " New Works" or "Sold Items" or "Sale Items". 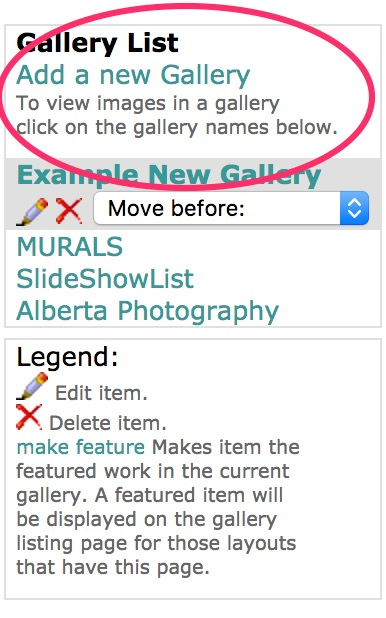 Here are the instructions to add a new gallery to your website. Give your new gallery a Title. A 'Description' and 'Extra Text' is optional and may not be displayed in some layouts. Scroll down and click the 'Add new Gallery' button to save. Under your Gallery List, you will see your new gallery and can now click on it to add specific images to it.